Sampson Stewart is my ancestor. He arrived from County Down, Ireland and settled near Guilford County, North Carolina on 460 acres of land. There is no information regarding his rank during the Revolutionary War, however, it is certain that he was in the Continental Army. Because I retired as a Lieutenant Colonel, I created the Sampson Stewart character with the rank of LTC. I got the inspiration for this project after reading David McCullough's 1776, and his biography of John Adams. 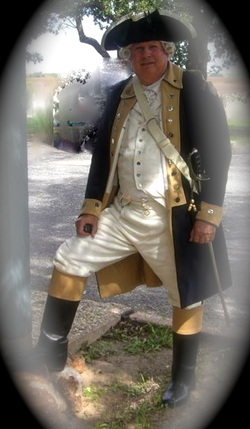 I searched the internet to find a tailor who could create an authentic Revolutionary War uniform. G. Gedney Godwin Tailor of Valley Forge, Pennsylvania was able to more than meet all my expectations while also helping with authenticity issues. I wanted to dress my character as an officer on Washington's staff. As such Sampson can serve as a courier delivering The Declaration of Independence, The Constitution, and Washington's Thanksgiving Proclamation to the citizens of the new country. This position on Washington's staff would also allow Sampson to discuss the Siege of Boston from an eye-witness point of view. I have presented to students as young as the 3rd grade and to adults of all ages. The uniform grabs their attention and the story holds it. I have been very pleased with the response to LTC Sampson Stewart.